Fifteen of us met for the first time on May 7th, 2003. Collectively we brought with us 250 years of barbershop experience. Our goal was to be chartered (officially recognized by the international organization) by the end of January 2004. 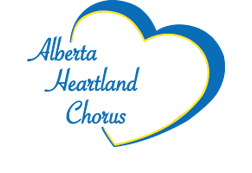 Alberta Heartland became a chorus in eight months and eight days (one of the fastest charters in history!). Membership in Sweet Adelines makes life busy, but FUN! At weekly rehearsals we exercise our bodies and our voices; we review old songs and learn new ones; we talk with old friends and welcome new members. We did our first performance in November 2003 at the closing ceremonies of the Canadian Finals Rodeo in Edmonton. We celebrated becoming a new chorus with a charter party and show in March 2004. In May of that same year , we attended the regional Sweet Adelines competition in Saskatoon, SK, where we sang, but did not compete, at 1st Nite. We were thrilled to be presented with our charter documentation at that event. In the spring of 2005, under the direction of Mary Teed, we competed at our first regional competition in Vancouver, and placed third in the small chorus category. We sing at local events, nursing homes, shopping centers and the Christmas light-up of the Alberta Legislature. For the past many summers we have sung the traditional “Daisy, Daisy” song at the Canadian Derby. In December of 2005, the chorus put on it's first show called "Christmas from the Heart". A few months ahead of time, we invited women to join us and learn two Christmas songs to sing on the show. We were excited to have thirteen women, the youngest only twelve years old, join us on that stage. It was so much fun that three of our "Divas" joined us full time. Our next show was a dinner show, in March of 2009. It was called "Seasons - Eat, Drink and Meet Mary", and was enjoyed by 250 guests. Also in 2009, Alberta Heartland was chosen to represent Alberta at Unisong. A giant choir of 350 voices from across the country came together to celebrate Canada Day in Ottawa. The chorus was able to tour Ottawa, sing at the Parliament buildings and with the Canadian Symphomy orchestra at the National Arts Centre. Truly, a trip of a lifetime. 2014 was a successful year, ending with a blockbuster of a show at the Myer Horowitz theater. We travelled around the world in song, taking the audience from the Maritimes to Africa and back to the Canadian Rockies for Christmas. Our next big show was "Where are you Christmas?" in November 2017. The Grinch made an appearance and River Hills Chorus from Wainwright joined us on stage. It was our most successful show to date. 2013 - Surrey - competed for the first time as a mid sized chorus under the direction of Lisa Hunszinger. Fourth place overall and most improved chorus by an amazing 71 points. Our director came home with a medal for the Novice Director's award. 2019 - Surrey, B.C. - First place, small chorus; Third place overall, AND Most Improved Chorus. We continue to perform around Edmonton and area. So far it has been a busy 2019 with performances, coaching and competitions. This year we will again be at the Valley Zoo for Canada Day and the Canadian Derby in August and look forward to Christmas performances around the capital region. In September, watch for show at Festival Place in Sherwood Park. It promises to be the best one yet!